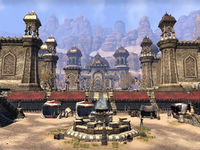 Hallin's Stand, formerly known as Ojwambu, is a city in southwestern Bangkorai in Hammerfell. It lies in a desert region known as the Fallen Wastes. The city was founded by Queen Ojwa in the First Era and named Ojwambu after her. During its early days, it was known as a rich and marvellous city. It also contained the Hall of the Virtues of War, where Derik Hallin, a venerable warrior and the last of the Ansei at the time, trained young Redguards in the Way of the Sword. By the decree of Queen Ojwa, owls were to be honored in the city, and it was forbidden to harm them. Some time after its foundation, the city was threatened by goblins from the Dragontail Mountains led by their giant warlord, Mahgzoor Rockhand. The goblin army marched west and conquered most of the Fallen Wastes, forcing the inhabitants to flee and seek refuge within the walls of Ojwambu. Soon the army was at the city gates. The only warriors in the city were Hallin and his few students. 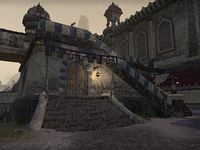 Hallin ordered his students to take the people of Ojwambu to the west, to the Alik'r Desert, and teach them the Way of the Sword, so the Redguard warriors would become numerous again. After leaving the city with her people, Queen Ojwa summoned the Father of Owls, for whom she was a friend, and asked him to go to Ojwambu and learn "how one man shall defend a city entire". Meanwhile Hallin, who was the only man left in Ojwambu, summoned spirits of all Ansei who had ever lived. The goblins, seeing the army that filled the city, decided to starve the defenders. Obviously, the spirits did not need to eat, and after many days of fruitless waiting the goblins started to suspect a ruse. The goblin shamans sent a scout to the gates, where he was killed by Hallin. This convinced the goblins that the warriors were real after all. Finally, Warlord Mahgzoor Rockhand lost his patience and unleashed his army upon the city. The battle lasted seventeen days. The goblins eventually won, but suffered serious losses, and both Hallin and Mahgzoor died in the battle. The Father of Owls then returned to Queen Ojwa and told her all that he saw. Over time, Hallin's students managed to train many fine Redguard warriors, and eventually they retook the city, which was then renamed to Hallin's Stand to honor its heroic defender. At some point later, Hallin's Stand became a part of the kingdom of Sentinel. The city, along with the whole Fallen Wastes, would often be a subject of dispute between Sentinel and the High Rock kingdom of Evermore, and at some point before the Three Banners War of 2E 582, Evermore managed to gain control of the region, which resulted in several Redguard citizens fleeing or being exiled. In 2E 541, Hallin's Stand was briefly captured by Durcorach during his invasion on High Rock. After the formation of the Daggerfall Covenant, High King Emeric and King Eamond Guimard of Evermore supposedly planned to give Hallin's Stand and the Fallen Wastes to King Fahara'jad of Sentinel, but after the death of King Eamond, King Emeric changed his mind, expressing his wish that Queen Arzhela, Eamond's widow, ruled the whole Bangkorai, including the Fallen Wastes. Around that time, most Bretons considered the region to be a part of High Rock. Around 2E 582, Hallin's Stand was ruled by Grandeya Nuwarrah. In that year, the city was briefly captured by Magus-General Septima Tharn and the Seventh Legion, but it was soon liberated by the Soulless One, in collaboration with Ufa the Red Asp, the legendary leader of Hallin's Stand Thieves Guild. Around that time, the city was home to the Yokudan Heritage House, which collected books and documents related to Redguard and Yokudan history. ^ A Royal Embarrassment — Aemilianus Falto, "A Concerned Citizen"
This page was last modified on 21 October 2018, at 08:21.